28 May 2012: This Surya system has been in place since March 2010, and it has been operated by an AKO controller since April 2010 (used a time clock for the first month). The little thermal sensor in the Sunbox has been suspended in the airspace above the black chillers, and the control has been based either on delta-T between that and the ground loop, or the absolute air temperature. Assuming that it needs some good delta-T to push through the plastic body, I set the delta-T quite high. and so was the pump from running dry too long. Finally, both packed up and the system leaked. 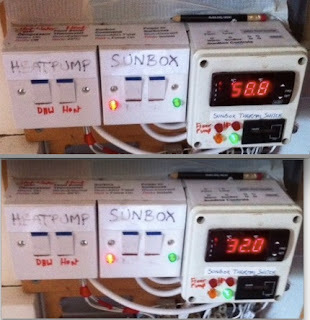 I have been watching the system through the recent heat wave and thought that the Sunbox possibly acts as a borehole 'cooler' if one gets the parameters wrong. If the borehole has risen to 17ºC during the hot day, and the air temperature is 25ºC, it could be harmful to be running it in the early evening. It achieves either nothing, or a negative effect. After a couple of months with the Tubes, I realise that it is more reliable to use the actual liquid temperature in the Sunbox as the trigger. With this, I can use a much smaller Delta-T. A difference of 3 degs or 4 degs would be quite enough. Any higher than that, and it would keep snuffing out as the colder liquid reached the position of the upper sensor. The pity of it is that I won't have a means of knowing the air temperature in the Sunbox. I have enjoyed seeing this for the last two years, taking pride in the rise in temperature thanks to its construction and air tightness etc. Perhaps I can get a very inexpensive thermal sensor with a display that can be positioned next to the controller.